But I wasn’t born eyeliner-savvy: My lids are slightly hooded and greasy as they come, so it's taken plenty of raccoon eyes, gallons of makeup remover, and countless return trips to the beauty aisle before I earned my wings. Since then, I’ve tried nearly every top-rated liner under the sun, and I’ve fallen in love with fewer than I can count on both hands. Maybe I'm picky, but just because it deposits black pigment doesn't necessarily mean it's good. Some liners are deceiving and will impress you with a dramatic opaque line before smudging as soon as you blink; others dry out quickly and can barely last through a few strokes. 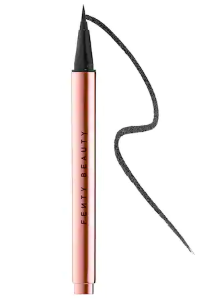 So, despite my love for Rihanna and her Fenty Beauty empire, I looked at her Flyliner marker in Cuz I'm Black with a critical lens when it was time to test for our 2018 Beauty Innovator Awards. Its name, an ode to both Rihanna's most epic Twitter clapback and the colour of the marker, was enough to make me a believer. But the real test was seeing if it could survive a ten-hour workday, accidental eye-rubbing, excessive yawning, and my buttery lids — without making me look like a panda. Regardless of whether you can't keep a steady hand to save your life or can wing it at your desk without a mirror, this liner won't fail you. Just tell your Uber driver to take it slow — no matter how perfect the formula, one bump in the road, and the whole liner-on-the-go operation is a bust.